Today I would like to show you my tag #3 for Linda's 12 Tags of Christmas. I am doing quite well keeping up even though it’s not in the right week, but that doesn't matter. If you go take a look at Linda’s example you will see I have taken my inspiration from the colours, using brushed pewter distress stain and the marbled stain technique (see P46 of Tim's Book 2), using metal and stamping on acrylic packaging. The rest is mine lol. 1. Background - marbled stains technique with brushed pewter, picket fence and weathered wood DSs. 2. Metal - alcohol inked with denim blue. 3. 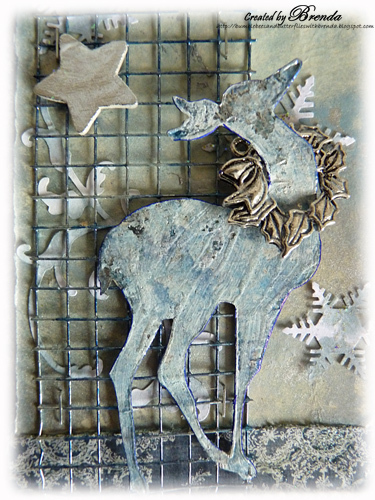 Deer - die-cut from reindeer flight in card covered with metal tape. Alcohol inked with denim, sailboat and silver finished with a light cover of white acrylic paint. Finished by edging it with a blue sharpie to make it stand out more. 4. 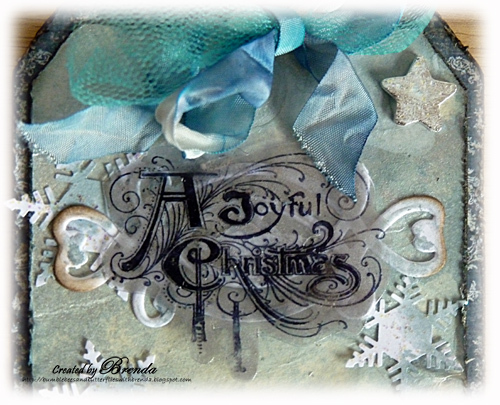 Sentiment - stamped from mini holidays onto acetate packaging, cut out and dabbed with brushed pewter DS underneath. 5. Snowflakes – punched & dabbed with weathered wood DS, ice stickles added over the top. 6. White die-cut dabbed with weathered wood and picket fence DS. Finished by making it into one of my extended tags using DP from MME. I hope the world is a happy place for you. WOW Gorgeous Brenda. What a beautiful Tag. Love the blue colors and the composition. I´m sitting here licking one´s lips, Brenda...sooo stunning...I recently bought the small deer...hope to use it soon! Thanks for your lovely visits at my blog! gorgeous--so icy wintery--just like the weather outsidei! a gorgeous winter tag! love the icy colors! beautiful tag, love the wreath around the deer and the pom-pom trim is perfect. Thanks for joining us at Stampotique Designer's Challenge. 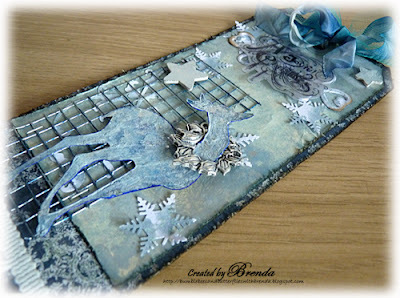 Thank you Brenda, for the tutorial..it is such a pretty, pretty tag. Wow Brenda this is so beautiful a truly quality creation, the colours and design look awesome. A beautiful tag Brenda, llove the embellishments. Really beautiful tag Brenda and love the cool colours and texture on there. My fave sentiment from that stamp set too. Sorry to hear you had mega problems as well (from your post today) and glad you got them sorted as it sounds rather scary. This is so lovely, festive and so rich in little details! Beautiful tag, Brenda! Love that metal (need to use mine!) against the soft coloring. This is such a beautiful tag Brenda and I absolutely love the pom pom trim. BEAUTIFUL tag!! Love that pom pom trim!!!! Thank You for joining us this week at PIO!!! Gorgeous - love the blues you've used and that reindeer. Very snowy!! So lovely, Brenda (breathing another huge sigh of relief that it hasn't all disappeared!)... just love the colours and texture! But I'm now two tags behind... scary! Wow... I just got a twinge excited for the holidays... Thank you. Thanks for Joining us at Stampotique this week. Hope to see you soon. Totally gorjuss, thanks for joining us at That Craft Place this time. Fantastic tag, love everything about it!! Stunning colours and that dear just really makes the whole thing pop!